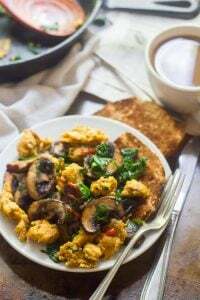 This savory vegan chickpea scramble is made from a chickpea flour batter that’s scrambled up with garlicky sautéed spinach and mushrooms. I know some of you guys are going to scoff at this (mom), but I’m really excited about how cold it’s getting outside. This morning I saw a bunch of snow-covered cars in my neighborhood. There was no actual snow on the ground in my neighborhood, but about a mile down the road they’d gotten a nice coating. We’ll get ours soon enough. I’m sure of it. Since we’re talking about winter (assuming you haven’t clicked away in disgust), let’s talk about winter food. When it starts to get cold out is when I start to really crave hot and hearty breakfasts. I love savory vegan breakfasts and have been meaning to do some more playing around with chickpea flour for a while now. 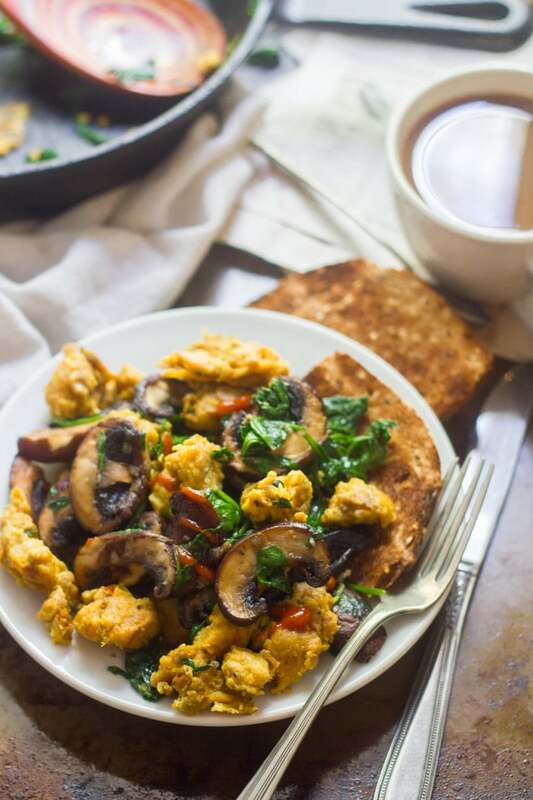 My husband is the expert egg cooker in our house, and mushrooms and spinach are among his favorite scrambled egg stir-ins, so I figured I’d try them out here. Every time I make something with chickpea flour, I tell myself I don’t make nearly enough things with chickpea flour. There’s something incredibly satisfying about biting into just about anything made with this stuff. It’s also insanely filling. I’m vowing to put it to more good use over the course of the colder months — it seems like a very wintry food to me. Did I mention that it’s filling? I think I was pretty much set until, like, dinnertime on the day I made these. The other thing I love about this chickpea scramble is that you can do pretty much whatever you want with it, kind of like scrambled eggs. 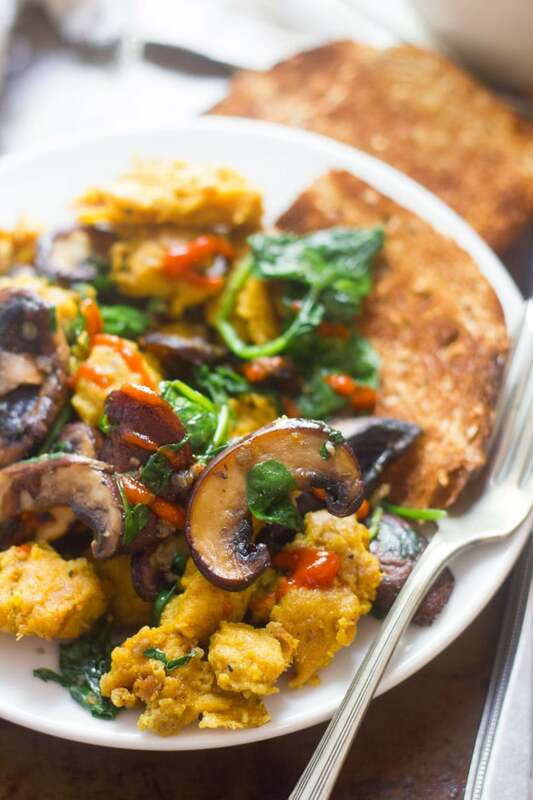 If you’d be inclined to eat your scrambled eggs plain, do that with your chickpea scramble. If you like them on toast, that works too. My favorite way to eat this though, is in a burrito. (Which I would have included in the pictures, if not for the fact that burritos are the hardest thing on the planet to take a nice picture of.) Whichever way you choose to eat these, a little hot sauce rounds off the savory in these with some spice. 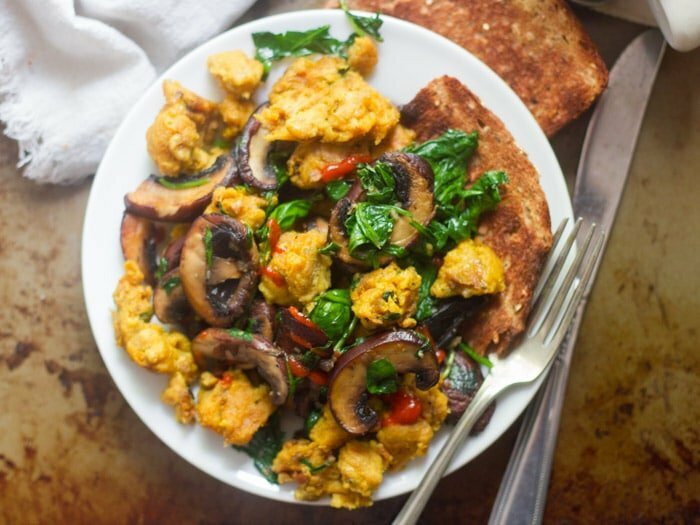 This savory vegan chickpea scramble is made from a chickpea flour batter that's scrambled up with garlicky sautéed spinach and mushrooms. Stir together chickpea flour, nutritional yeast, turmeric, paprika, salt and pepper in a small bowl. Add water and soy sauce, and whisk everything together until blended completely. Set aside. Place 1 tablespoon of olive oil into a medium skillet and place over medium heat. Add the mushrooms in a relatively even layer. Allow to cook 4-5 minutes. Gently flip and cook another 4-5 minutes, until lightly browned. Add the spinach and garlic, and sauté another 1-2 minutes, until the spinach is wilted and the garlic is very fragrant. Remove the spinach and mushrooms from the skillet and transfer to a plate. Coat the inside of the skillet with the remaining 2 tablespoons of oil. Pour the chickpea flour batter into skillet and allow it to cook about 2 minutes, until it begins to firm up around the edges. Use a spatula to break the chickpea mixture into chunks. Cook until chunks are about the firmness of scrambled eggs and lightly browned in spots, about 5 minutes. 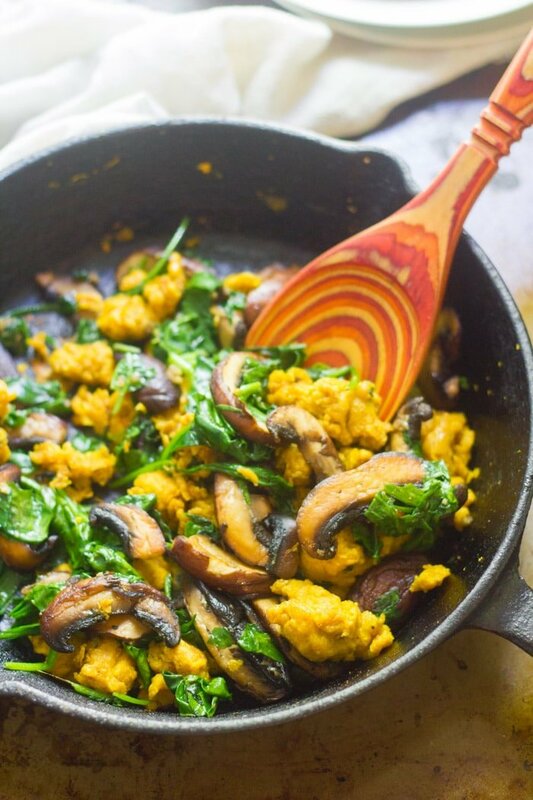 Return the spinach and mushrooms to the skillet. Flip a few times to blend. Serve with toast, tortillas, hot sauce and/or ketchup. Use a good nonstick or well seasoned cast iron skillet, as the chickpea batter has a tendency to stick. I cannot wait to try this recipe! My family (2 vegans, 2 omnivores) loves pressed, cubed fried tofu, but I haven’t been able to sell them on tofu scramble. This recipe gave me the idea to replace the scrambled egg in my veggie fried rice with the scrambled chickpea batter. I loved it! Husband and toddler liked it too. A keeper. Can’t wait to try the chickpea flour in your other recipes. I just made this, it was so tasty! Thanks for the recipe. This is definitely going to become one of my breakfast staples..
What a brilliant recipe! I tried this for breakfast this morning and it was super tasty. Definitely will be part of my regular breakfast rotation ! Oh wow! I never even thought about making a scramble out of chickpea flour. THIS, m’dear, looks amazing! I have made this Chickpea scramble several times now. I have finally found a filling, tasty breakfast entree, to replace my oatmeal at least a couple times a week!I I will be making this in the morning. Awesome! Glad to hear you’re enjoying it! Can sprouted chickpea flour be substituted for regular chickpea flour in this recipe? Thanks for the advice! I think so. As far as I know they’re generally interchangeable, but can’t say with 100% certainty. This is the best vegan scramble I’ve had yet. I’ve been looking for a savory breakfast recipe to replace scrambled eggs and now I’ve found it. Amazing! Glad you liked it! Thanks Monica! I made the recipe exactly but have to admit I didn’t care for the taste, I’m disappointed. The texture was like what it really is, bean flour mixed with water. I made it into chunks like the directions though and that was fine, I just didn’t like the way it tasted. I ate some on a tortilla with lots and lots of salsa on it & had to toss the rest. Too bad, I was expecting to like it. Thanks for the inventive recipe, glad others enjoyed it. Why didn’t this come out? I did everything as described. The chickpea mixture just never set and remained raw and runny. Oh no! I’m not sure what happened! It does take a few minutes for the bits to cook up and brown completely, but it definitely shouldn’t remain runny. The only things I can think of are not enough heat, since different cooking equipment will vary, and trying different cookware. I used cast iron, which is good for heating evenly. Made this chickpea scramble with red bell peppers, zucchini, and mushrooms and it was delicious. Dare I say it tasted better than scrambled eggs. My husband said he could eat this every day. It was very flavorful. That sounds delicious!! I’m glad you both enjoyed it! Thanks Sara! I love garbanzo flour, so I can’t wait to try this! But as a Celiac, I can’t have soy sauce and we don’t have an alternative in my country. Can you recommend a vegan/gluten-free substitute that might work? Or just leave it out completely? Hmmm…can you get ahold of tamari or liquid aminos? Those are usually the best substitutes. If not I’d just try adding salt to taste! I have tried this repeatedly and it always has a raw dough/pasty center. No matter how long I cook them. I’m open to it being my fault but can’t figure out what I’m doing wrong or if they’re just supposed to be that way. Hmmm… sorry to hear that! What type of pan are you using? I find a cast iron skillet works best, I guess because of the even heat distribution. You could also try breaking it up into smaller pieces. I had high hopes, but it was just a doughy mess. It never scrambled. :( Bummer. Question….would love to make the chickpea mixture and save until later…does it get too thick? And for those who felt that had doughy mess…keep mixing, keep going, keep chopping and turning with a spatula. The initial set up of 2 minutes gets it started, then you have work to do for a good 5 minutes to get it to the right consistency. The flavor is great on this scramble but the batter really needs some baking powder to give it that fluffy egg texture. I scrambled for well over 5 minutes and it’s still like a bean paste. Edible but not as good as some other recipes I’ve tried. my first ever vegan scramble, a success! 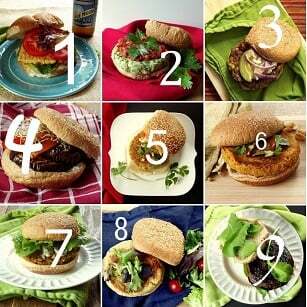 I made these with onions, garlyc, and some fresh herbs from my garden and served over (vegan) buttered bread. Super flavourful and filling! thanks for sharing this!